Anaerobic Zone is pleased to announce the introduction of the Bike Bikini, the first totally adjustable, durable bike cover for bicycles mounted on roof racks designed specifically for either aero or road handlebars. Utilizing totally adjustable straps and buckles, the Bike Bikini is easily installed or removed in a matter of seconds and adjusts to multiple frame sizes for a tight fit. Once the adjustments are made, the Bike Bikini requires no additional fine-tuning for repeated usage. There are unique models for both road and aero bars. Aero bars protruding through after minimal usage is a thing of the past. The Bike Bikini features unique and extremely durable construction. 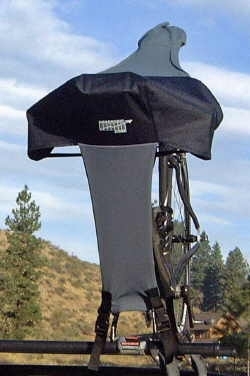 The "cockpit" cover is made with a 600 denier, nylon top layer that absorbs moisture and keeps road kill and debris off the bike while the underside layer of waterproof vinyl protects and deflects moisture from the bike's key components. The saddle cover is waterproof as well and the stretch Lycra® panels ensure a tight fit. Anaerobic Zone will replace at no charge any Bike Bikini that is damaged from a shift lever, brake lever, armrest or handlebar protruding through the cockpit cover. The Bike Bikini is easily maintained by machine washing and hang drying. Go to www.anaerobiczone.com for more details or stop by Booth #6219 at Interbike.